Well, it’s that time of year again, you’ve put up – and pulled down all the Christmas decorations, enjoyed the food and presents, spent time with family and friends and perhaps even been away on holidays – and now it’s all come to an end. Time to get back to work, trouble is, even if you have only had a short break, sometimes it’s hard to re-adjust yourself back to the schedule of work. For some the thought of returning to the 9 to 5 daily grind, the roster or the shift work can be daunting, so here are a few ideas to help you ease back into the work day. Take time to have a rest or just relax the day before you get back to work – while that might have been all you were doing anyway, it’s a good idea to spend your last day relaxing, don’t to chores, shopping, or go out. Take time for yourself, prepare your work clothes the night before you actually return to work, iron work clothes, sort out your bag or briefcase, set your alarm. Take time to have everything out and handy so you don’t forget anything and don’t find yourself in a panic trying to find your other shoe. Be sure to go to bed on time on time, and if you’ve been travelling don’t schedule your return for the day before you are due back at work. Where possible – get a head start. While that doesn’t sound very appealing if you do get to work early on your first day back it can actually help start your normal routine. Don’t drag your feet when you get out of bed and moan and complain about having to go in – by arriving early it can push you back into the familiar routine. Depending on your work or industry, make that early start at your desk a chance to follow up on any unfinished work, check your e-mails, answer any you need to and look back over what you had been doing before the break to see what you were working on. If you need to check your voice mails or missed calls, it’s a great way of catching up, staying on top of things and getting back into the *swing* of it. Take time to review any goals you have set yourself for the New Year – it doesn’t matter if the goals have been set by your team leader, boss or by yourself. What is it you hope to accomplish this year? Are you hoping to be promoted? What do you need to achieve to make that happen? Did you complete your goals during 2012? If not now is a great time to wrap up loose ends and reach the goals you had set. By taking time to review your goals it will help remind you what it is you need to do now your vacation is over. And finally don’t forget to catch up with your co-workers – ask them what they have been up to over the holidays and ask them how they have dealt with their return to work? Many workers find it hard to get back into the work *mind-set* after time away. 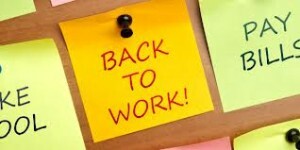 How do you handle returning to work after the holidays? Have you got any other tips to share? We’d love to hear what you think.